I saw these religious printed plastic eggs on Oriental Trading but I didn’t want to pay for them. I wouldn’t say they were expensive but once you factor in shipping, they are a lot more than the dollar packs of plastic eggs you can get. So I made my own. On some I used paint pens and on others stickers. All told it took me less than an hour and cost less than half what the others would have been. Like I said before, I want this Easter to keep the focus on Jesus and this was just one more cute, quick way to do that. 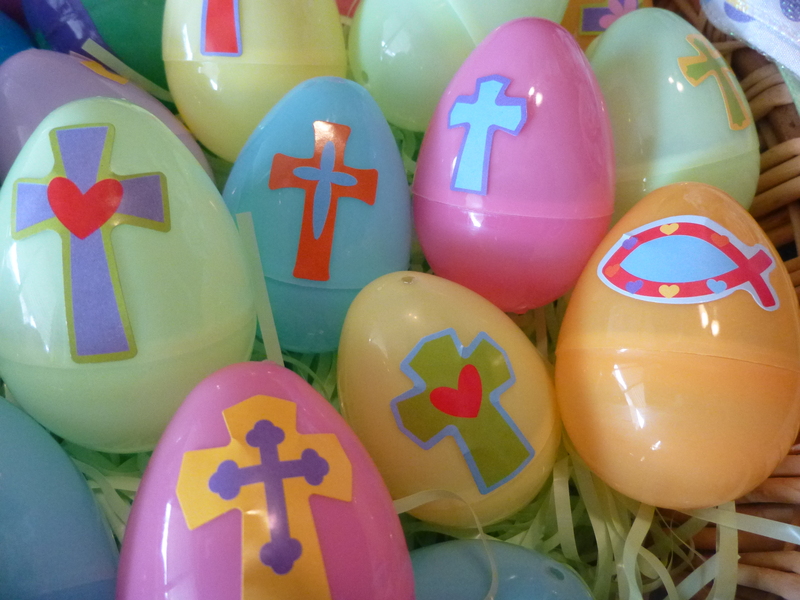 With the Easter holiday approaching, I’ve really wanted to keep the focus on the true spirit of the holiday, Christ’s resurrection, but I certainly don’t want to toss out our family traditions of Easter egg hunts and baskets. 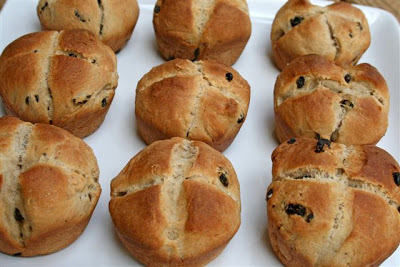 So, here is one attempt to make our traditions support our faith more. 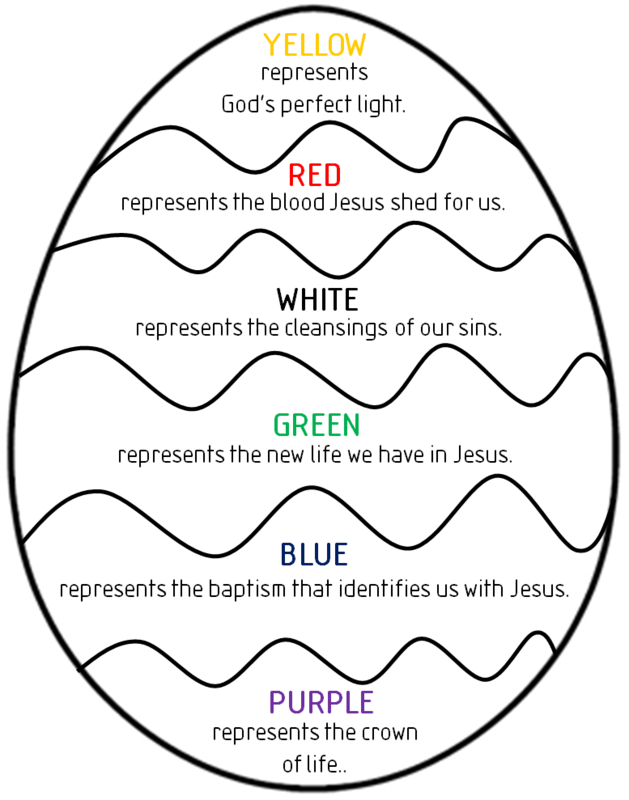 I had my husband make this printable for us to accompany dying Easter eggs. 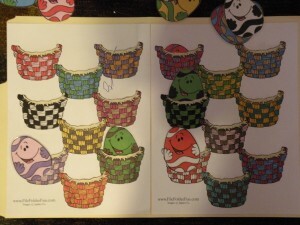 The girls colored each section and then we cut the pieces and turned it into a puzzle. (My girls had a very hard time leaving the white section blank). I laminated the sections to help it last. I know it’s a silly title, but I just couldn’t resist. 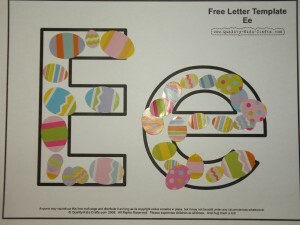 With Easter fast approaching we had some fun with eggs and the letter E. And these are really easy activities that you can do with things around the house. Also, while it’s not listed on here, there is no reason why you need to wait until Easter to hunt for eggs around the house. Have mini-egg hunts without the candy. The chick popping out of the egg is an oldie but a goodie. 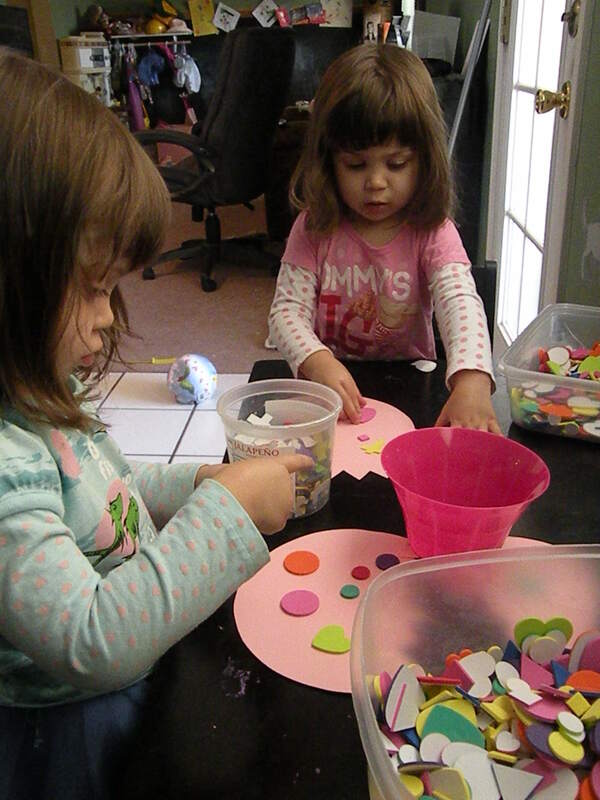 We decorated the eggs with fun foamies–since I wanted it to just be designs and not little animals or pictures this time, I used the Art Deco fun foam pack I found at Walmart. For the chick I actually used a coloring page picture that I print ed on cardstock and cut out. To make it even easier, you could print out the chick on yellow paper. We were just going to color the chick with marker but then I remembered I had some yellow feathers. The girls got carried away with gluing on the feathers so then I added googly eyes and a beak. The beak is made out of an orange pipe cleaner about 2 inches long. I folded it like a figure eight and then folded it in half. The girls have loved playing peek-a-boo with them! The girls also enjoyed this basket of eggs gluing activity you can find here. My plan is to make one of these for every letter. 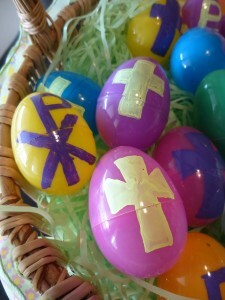 Today we did Ee and decorated them with eggs, well, Easter eggs to be exact. 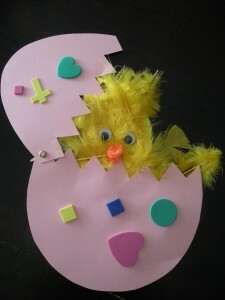 We used stickers from Michaels (one of their $1 packs) but you could even cut out your own eggs to glue on. 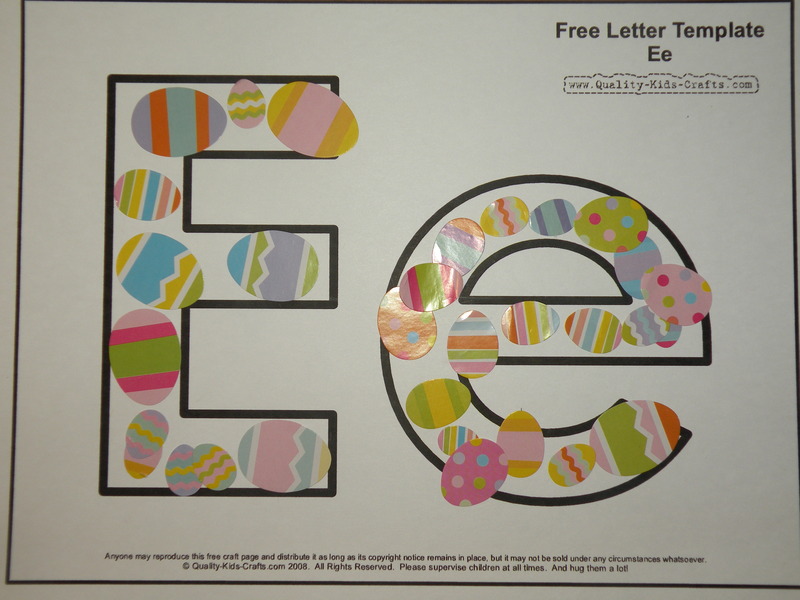 We also did some other E printables–coloring them, tracing the Es with our fingers, and practicing the sounds it made. I was trying to get lunch made and the girls were getting cranky. Then I saw the hard boiled eggs and remembered egg races from picnics–you know when you would race with an egg on a spoon (or maybe just I did that). Because the girls are little, I used utensils I had for serving pasta that have more of a spoon part to them and of course hard-boiled eggs. I got the girls all set up and then the went around the house balancing the eggs. 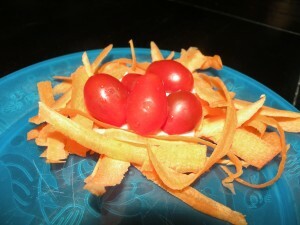 It turned out to be a great exercise for focus and balance–and I got to make lunch in peace. 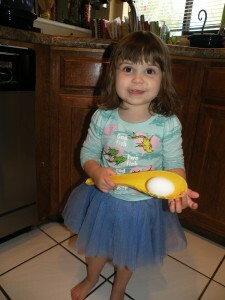 They even moved on to smaller spoons, although the eggs did end up being very cracked. We will definitely be doing this again in the future. I love it when activities just appear! We also played some egg file folder games. 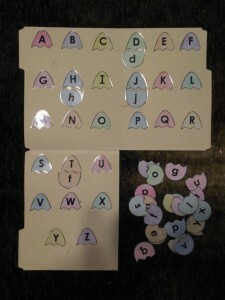 One was cracked eggs where you matched the upper case letter with the lower case letter. 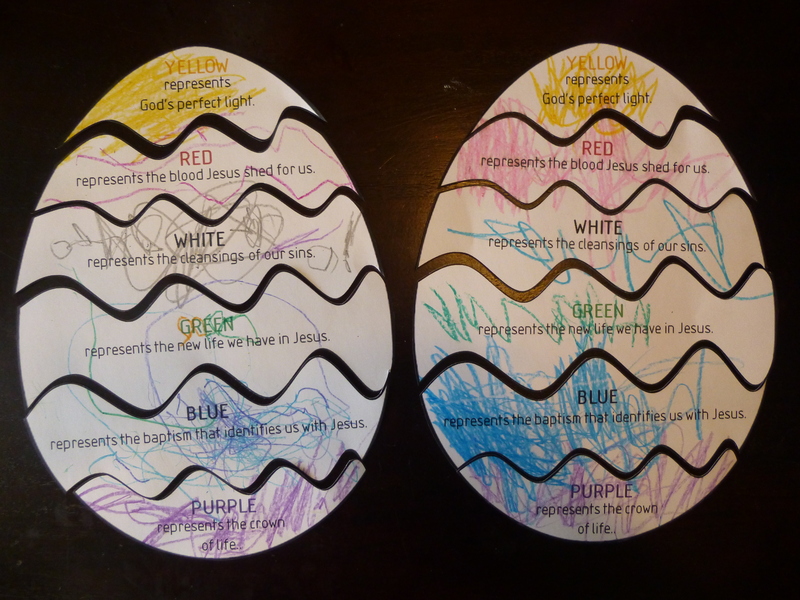 The game is in black and white so I colored the eggs myself to make it prettier and easier for the girls to distinguish the letters so that it was a little less overwhelming. 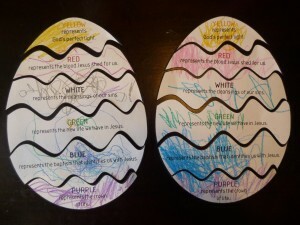 Older kids could certainly color the eggs themselves. The other game is practicing visual discrimination. 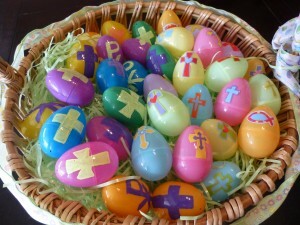 They match the egg to the corresponding basket. I liked it because it was a little more complicated. 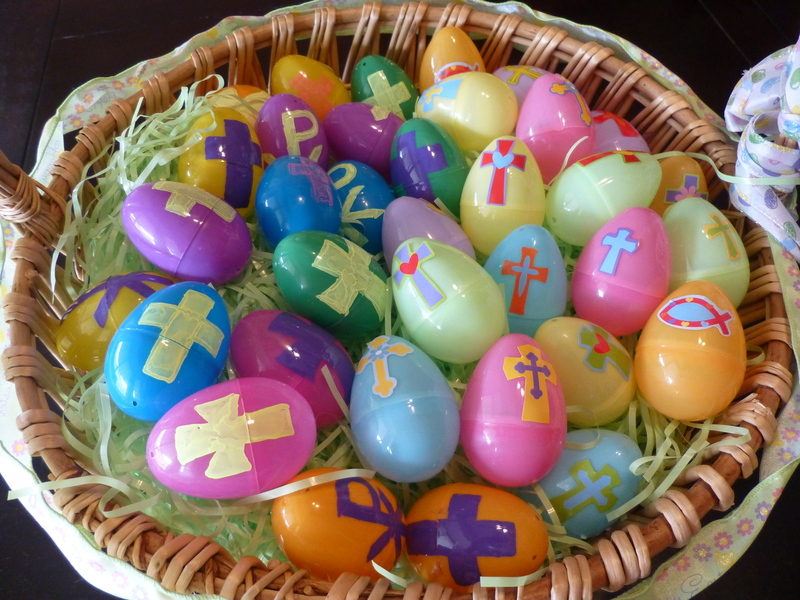 The girls know their colors but this one had more than one color on each egg/basket. They really had to look at the whole thing as opposed to just one color. I used an exacto knife to slice the top of the basket so that the egg could slide into it. 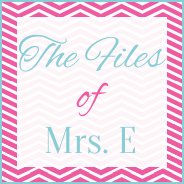 This has to be the easiest felt board story to make! It’s just five eggs. 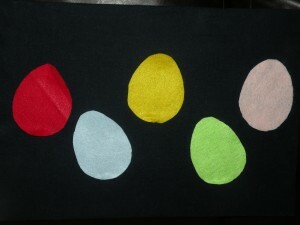 Of course, you could decorate the eggs more instead of just cutting five eggs out of felt like I did (I had big plans for decorating them and making them look a lot cuter but those seemed to fall by the wayside). 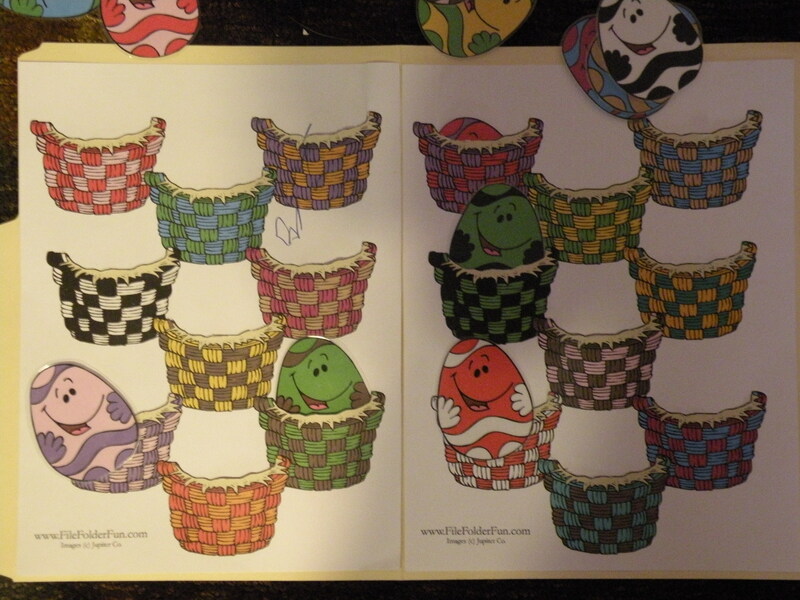 I actually found two felt board stories–one adding the eggs and one taking them away. I changed the colors just a bit on one so that you could use both together. 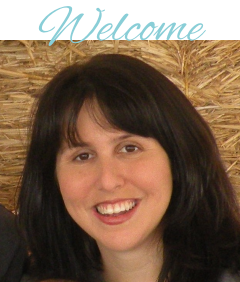 On the second one, we actually change the names of the family members to be our names, including the dog. I found one in a slipper, And the egg was colored RED! I found one in the closet, And the egg was colored BLUE! I found one in a bucket, And the egg was colored YELLOW! I found one in a shoe box, And the egg was colored GREEN! I found one in the garden, And the egg was colored PINK! 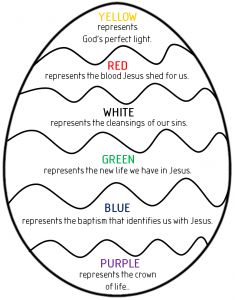 Red and yellow, Green, pink, and blue. I found five eggs -How about you? TWO little Easter eggs, Oh, what fun! Brother ate the green one, Then there was ONE. ONE little Easter egg, See me run! I ate the last one, And then there was NONE. 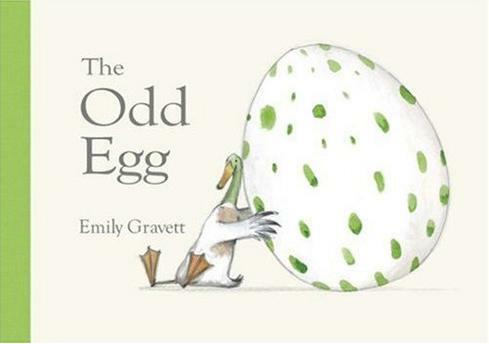 We also read books that had an egg in it or featured the letter E a lot (that way the girls could find all the E’s on the title page–not the entire book or we would never finish). 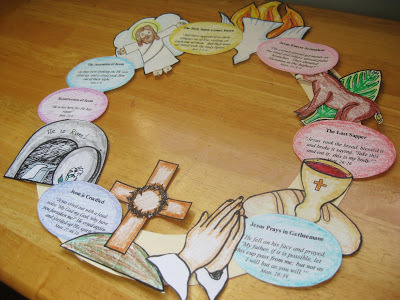 Here are some of the activities we’ve been doing to celebrate the Easter story. 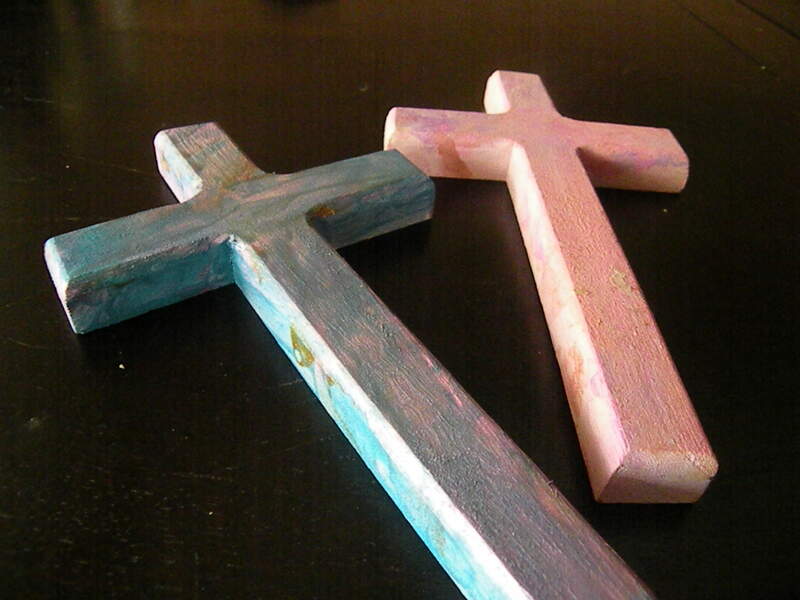 I have more Easter activities that I will be posting shortly, but I tried to group like activities together. 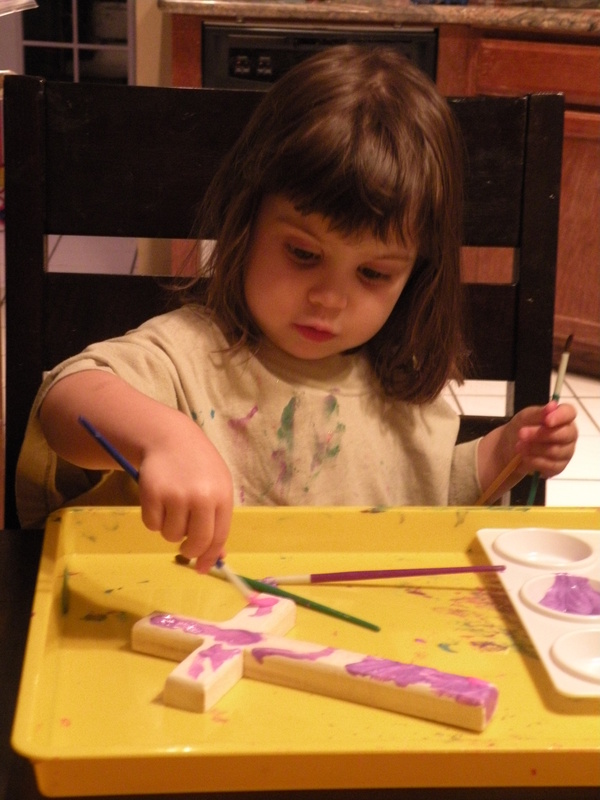 I actually had a different cross craft planned but the Zoe found these when we were at Michaels so we switched gears and painted crosses. They are only $1 but you could certainly make your own out of wood or cardboard. 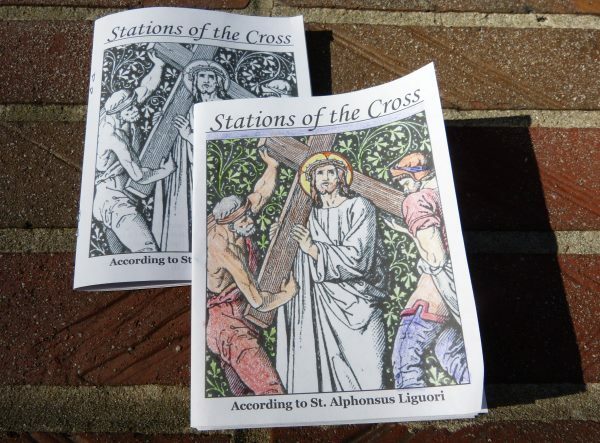 And while I know that Jesus did not die on a shimmery pink cross, I think it’s important for the girls to connect with the cross and the sacrifice and salvation it represents. We used the shimmer paint to give it a little sparkle and while I let the girls pick their colors, I also limited them to just a few choices that wouldn’t look too bad if they were all mixed together. We also sprayed them with sealant afterwards and will be hanging them on the wall in their bedroom. My super awesome sister actually shared this idea with me! We bought the terra cota base, some soil, grass seeds, and decorative stones at Walmart and used a 2 1/4 inch terra cota pot I bought at Walmart. 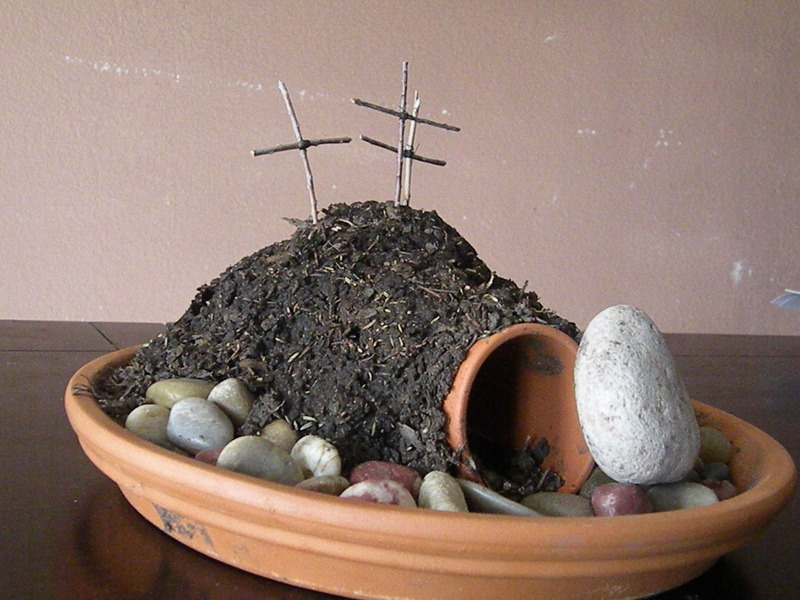 Next to the pot lying on its side, I put a rock to build up the hill. 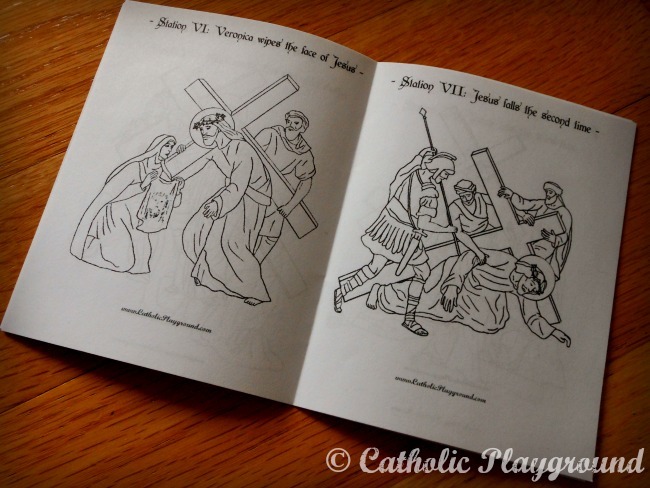 Then we found the twigs to make the crosses. I tied them together with thread but I’m warning you that was a bit of a pain. Our’s looked a lot better before the dog got ahold of it and we had to pick the soil off of the grass. And of course, our grass hasn’t grown yet. You can actually find a picture of a prettier one here. 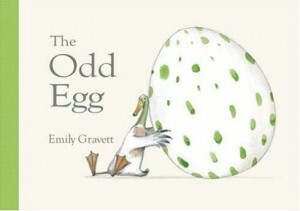 This is actually my favorite Easter book to read with the girls. They are really into the Berenstain Bears right now, but, I mean, who doesn’t love the Berenstain Bears? Jesus dying on the cross can be scary to some children, but what I really like about this one is that it tells the Easter story with all the important parts in a way that the kids can really understand it. 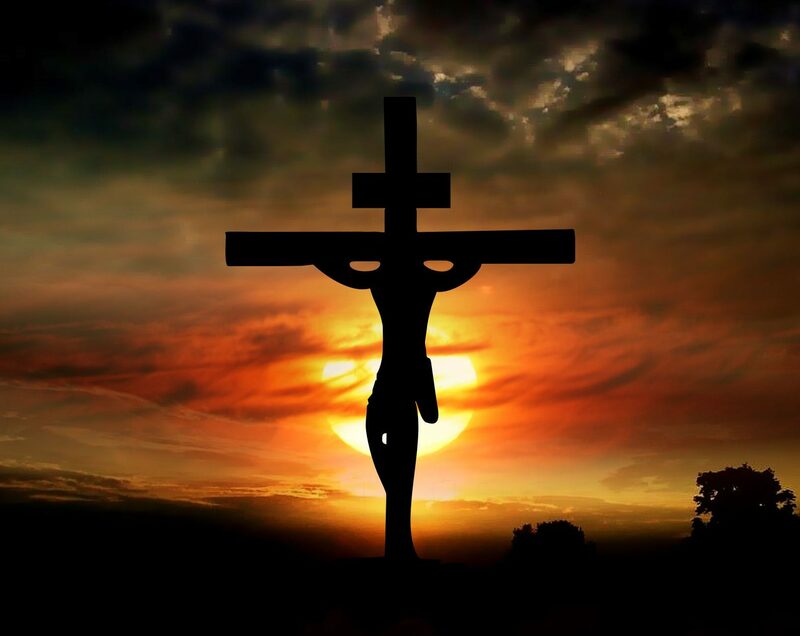 Some of the other stories are too graphic, or leave out important details (we have a book of Bible stories that leaves out the whole ascension into heaven), or they are just a little hokey.